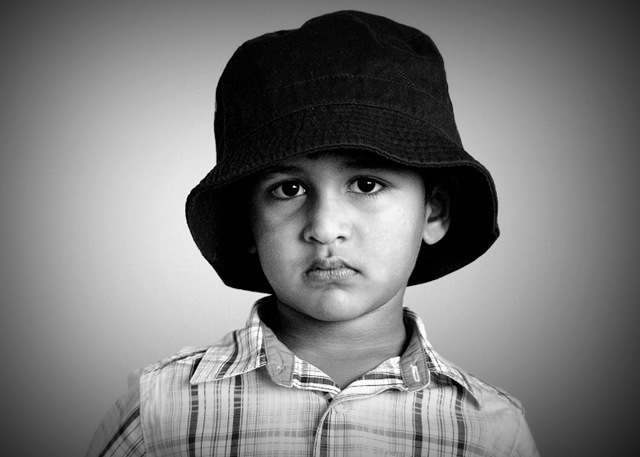 Another portrait of my son that I unearthed today while browsing through my archives. Picasa is a wonderful tool to index all photos and organize them. This image was shot as JPEG using one of my favorite fixed lens camera, the Panasonic LC1. No other camera I have provides this amazing contrast and razor-sharp rendering. With the more advanced GH1 and some of the best lenses available for the system (Leica 25/1.4), you still have coax the image in post-processing to get the best. Not with the LC1. In fact, my single wish is that Panasonic update the LC1 with just a more modern sensor that can do 12 Megapixels. And please keep the rendering as it is. Post-processing of this image was done completely within Picasa. I think if you start with a really good file, the post processing application can be anything decent and you can end up with a good image. After cropping and conversion to black-and-white using the generic converter in Picasa, I applied the Holga-ish plug-in, which adds severe vignette and increased contrast. I think the effect works for this image. The photo was shot in my room in 2010, with the plain wall as the backdrop and a single source of light from a large window. < We are the Boys! Yes, absolutely true. But it takes a lot of time to get there, though!